With the Kurdish People’s Protection Units (YPG) and the Burkan al-Furat forces of the Free Syrian Army fighting together against the Islamic State’s forces, clashes around the city of Tal Abyad at the Syrian-Turkish border have escalated. The conflict has forced tens of thousands of people to flee to the city of Akcakale on the Turkish side of the border. The Turkish authorities opened the border for displaced Syrians for a few hours on two occasions: on June 3, 2015 for the first time, then again 11 days later on June 14. 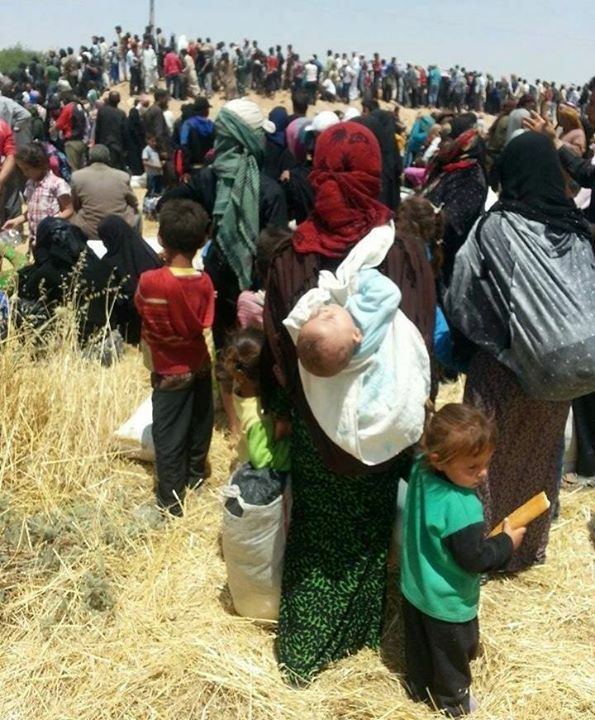 According to the official Turkish figures, approximately 25,000 Syrians entered the country on those two days, and most were women and children. Nadir fled with tens of other families after the YPG surrounded the village. “The bombing was very intense. I was scared that a blockade might be established, or that the YPG might kick us out or might accuse us of supporting the Islamic State. I read many news reports that documented systematic ethnic cleansing campaigns against Arabs in the areas now controlled by the YPG.” All that Nadir could take with him when he left his village was a little bit of food and water, and some official documents. “My son is disabled and I hope that I can find a good doctor here in Turkey.” His kids still can’t sleep at night. “Every time they hear a missile, they jump out of bed. Hopefully they’ll be better when we move to the camp.” Nadir still does not know which camp he’ll be transferred to. The Turkish border patrol fired water cannons into the crowds on the other side of the border. “We can’t let them in and they keep attempting to enter Turkey illegally. They were angry and they threw rocks at us. We have to keep them away from the Turkish border until we receive orders from Ankara,” a Turkish officer explained. Manal, Ahmad’s wife, does not share the same opinion of the Turkish border patrol. “They were very nice. They carried our son, Khalid, when we crossed the border and one of them was playing with him as if he were his own son. It is true that they threw the food to us, but they had no other way to help, because we were on the other side of the border,” she says. Manal explains to us, “Although the house was not completely destroyed, Ahmad believes that we won’t see it again. He believes that either the Islamic State will confiscate the house as a punishment for leaving it, or that it will be bombed and completely destroyed.” Manal tries to cheer Ahmad up by promising him that they will buy a new house in a free Syria – free from the regime and free from the Islamic State. Omar Abdullah is a contributor at Syria Deeply.